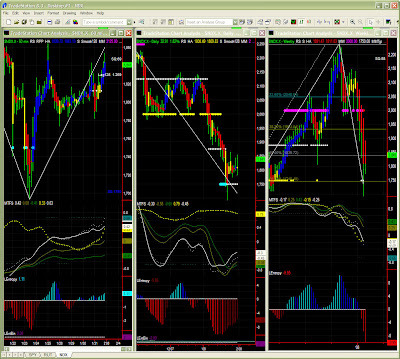 Got it a little wrong yesterday on RUT at 60mins level, as i didnt anticipate an up day. Volatility is indeed sometimes difficult to capture. The general outlook is however unchanged: caution is to be exercised. The market is not the easiest to read at present, and some may want to stay on the side line or play non directional as congestion is likely. SPY is testing MM pivot level and could well break out on the up side, but that it is still unlikely looking at current chart. It twice stopped on Fib target and is not showing energy to reach higher levels for now. 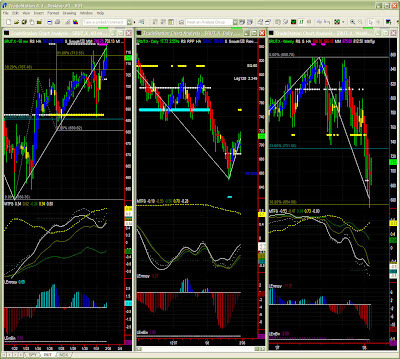 As said again and again, the MTFS line crossover cam too early, indicating in most cases either a failed recovery or at least a double bottom or cup&handle formation. Can yesterday's lows be the new support level? Possible even if not convincing. 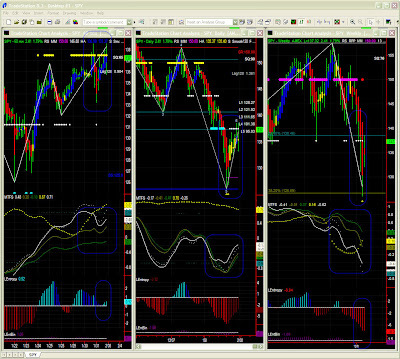 The 60mins chart is now dominant, so we'll have to take cues from behaviour at lower time frames for now. With the benefit of the doubt, MTFS line gradients, increasing entropy etc. a positive bias is there for the time being. MTFS and Entropy do still point downward, but EntBin is only -1 and MTFS significance level is quite low. No rejoicing however as we have to wait for Entropy to bottom out, MTFS to look better and the end of the series of red bars.